On a monthly basis, retail sales increased 0.6% from August to September (seasonally adjusted, after revisions - August sales were revised up), and sales were up 7.3% from September 2009. This is an easy YoY comparison because of the slump in auto sales last September following Cash-for-Clunkers. Retail sales increased 0.4% ex-autos - about at expectations. 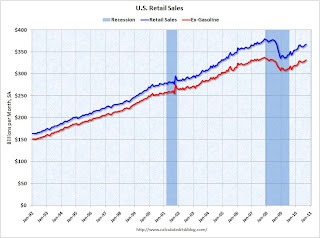 This graph shows retail sales since 1992. This is monthly retail sales, seasonally adjusted (total and ex-gasoline). Retail sales are up 9.6% from the bottom, but still off 3.2% from the pre-recession peak. Retail sales had moved mostly moved sideways for six months, but this is now the high for the year. 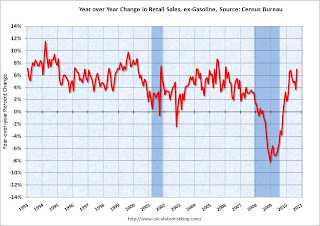 The second graph shows the year-over-year change in retail sales (ex-gasoline) since 1993. Retail sales ex-gasoline increased by 7.0% on a YoY basis (7.3% for all retail sales). 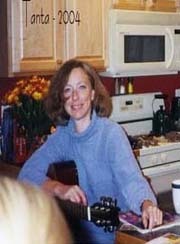 The U.S. Census Bureau announced today that advance estimates of U.S. retail and food services sales for September, adjusted for seasonal variation and holiday and trading-day differences, but not for price changes, were $367.7 billion, an increase of 0.6 percent (±0.5%) from the previous month, and 7.3 percent (±0.7%) above September 2009. ... The July to August 2010 percent change was revised from +0.4 percent (±0.5%)* to +0.7 percent (±0.3%).